Although he was closer to the early pace than originally intended, the result was all-too familiar for favored Stormy Liberal in today’s opening day feature, the Grade 3, $100,000 Eddie D Stakes at Santa Anita. In registering his third consecutive victory while defeating his stablemate Conquest Tsunami by a head, he negotiated about 6 ½ furlongs down the hillside turf course under Drayden Van Dyke in a sizzling 1:10.93—which is just .20 of a second off the course record. 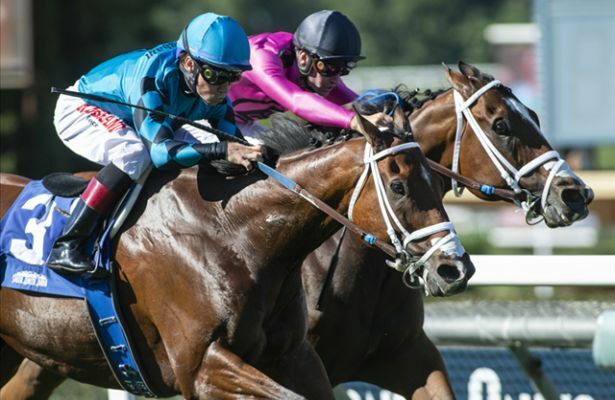 A winner of last year’s Grade 1 Breeders’ Cup Turf Sprint at Del Mar, Stormy Liberal, a 6-year-old Stormy Atlantic gelding, made it look easy as he reeled in Conquest Tsunami, who had opened up a two length advantage with three sixteenths of a mile to run. Although both Stormy Liberal, Conquest Tsunami and perhaps two other Miller trainees will now be pointed to this year’s Breeders’ Cup Turf Sprint on Nov. 3 at Churchill Downs, “Stormy” adores the Santa Anita turf, as he notched his eighth win from 14 hillside tries. Out of the Royal Academy mare Vassar, Stormy Liberal is now 29-11-8-1 overall and with the winner’s share of $60,000, he now has earnings of $1,368,930. Legendary Hall of Fame rider Eddie Delahoussaye was on-hand to present the trophy for the race that’s named in his honor.